Our friend, Åsa, did not know that she would be put to work for the morning when she dropped by our place yesterday. Shane and I were wrapping up our weekly meeting when she pulled up our driveway. 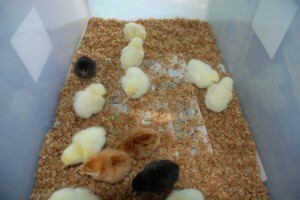 She had just picked up her 1-day old chicks at nearby Kentvale, and wanted to show them to us. They sure were cute! One of the things high on my to-do list was to take photos of our teas to post to our new website. Åsa has taken some photos for us in the past, and I asked her if she happened to have her camera with her. Serendipitously, she did! We got her chicks all set up in her portable bin, using newspaper and coffee chaff for bedding (coffee chaff works well as a chick bedding because the nitrogen helps absorb the ammonia odour). Next we gave them fresh water and some starter feed. We even sprinkled in some freshly picked clover and grass for them to practise their foraging. They stayed safely in her van with the doors open. It was such a hot sticky day that they were at the right temperature without a heat lamp! Then Åsa and I got down to business with a photo shoot. Thanks so much, Åsa, for all your time and help! The photos are amazing. Have a look at our Teas (T Line) and see for yourself.